Darlings, to the left you will find Alice + Olivia’s pretty in pink Chevron Dress with Tie – the very same one seen donned by Elisabeth Hasselbeck during a taping of The View; to the right take a peek at the sassy Summer at the Hamptons Dress in Pink via Lulu*s.
While the lovely Lulu*s is ever so slightly shorter than its haute couture counterpart; for just $56.00, as opposed to the $368.00 needed to make the Alice + Olivia original your very own, it is every bit as capable of giving you a crisp, nautical, high fashion look year-round, at a price that doesn’t break the bank! Some of us need it slightly shorter anyhow. Wow, great find. I love this dress, a lot! Amazingly so similar. I can't tell. Great price from Lulu. WoW they look EXACTLY the same!! So cool, they look so much alike. I'd go for the cheaper one. Wow one of your best finds yet! I can't even see a difference. I would definitely go with lulu's! mmm even though they are just slightly different. Alice + Olivia def looks better. Of course, I don't hv the $ to drop it on it though! ^^"
The Lulu dress is practically identical! 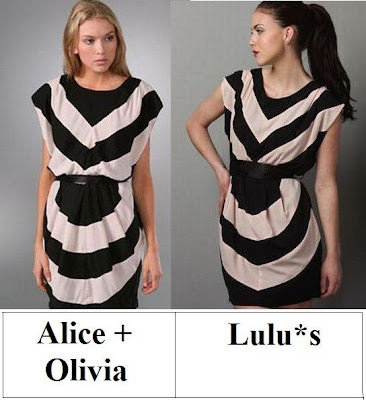 For the $56 price tag, I would definitely go with the the thrifty alternative :) Plus, I think Lulu model wears it better! CONGRATS on the new nephew!! Babies are so wonderful :) Shopping for them is a blast as well! Excellent find! You are so good at finding these duplicates! I would definitely pick the Lulu's version. My favorite is the Lulu dress. PERFECT match. Thank goodness for Lulu's, right? Cute! i really like this. Wow, these really look almost identical. Good find! Oooh they look so similar! Lulu's for me today :D The shirts remind of Mondo from Project Runway! You amaze me.....Lulu all the way. Shorter is better with leggins. They're practically identical. Great find! I am all over that Lulu*s dress ~ awesome find, E! I definitely love the Lulu's dress. It's a little more fabulous than the Alice + Olivia. Have a happy Thursday. GPB is based on a book?!?! How did I not know this?! I loove this look you have pulled and that the match is perfect! Definitely something RR focuses on when looking for daily posts to feature. all I'm up to today is having finals on my mind among everything else i ahve to do today! Lulu's!! I think it is a MUST! Woow, they look identical! You are super good at finding the best alternatives to super beautiful expensive items <3 ! how awesome! it's the same dress,. i'm going with the dress from Lulus--truly stunning. I am so in love with this dress! You have no idea how perfect it would look in my wardrobe! I'll take the Lulu's. So cute! They look almost exactly the same to me, so I will take the bargain please, lol! Hope you are doing well, sweetie. Sorry I have been in and out of the blog world so much lately. I will catch up as soon as I can! Wow, those are nearly identical! I'd go with Lulu*s! The one from Lulu*s is a fabulous match! Wow freakin amazing, you can't even tell the difference! Lulu's all the way!!!! It's such a pretty dress!!! The print on the front is amazing and they are really similar, so I'm going for the Lulus one. i think ilike the lower neckline of the Lulus one even though they realy do look so similar! great find! The Lulu version looks identical! Definitely thrifty!! I actually like the Lulu's version better. It looks like it fits better and I'm all for it being just a tiny bit shorter. I LOVE that you did this... I love love this dress!! Oh wow, so similar! It's amazing how you always manage to find these comparisons! I love the Lulu*s...it seems to have nicer fit. Wow, these are stunningly similar!